They say humans change completely every seven years, but when it comes to musicians it is almost impossible to set a standard rule. Some change from album to album, some never change, and some go through a series of hits and misses until they find a new sound. Take Belle & Sebastian for example. Traditionally known as an acoustic, indie-folk band; the Scots have embraced their need for change and seem to have finally gained the courage to release an electronic pop album worthy of the dance floor. Frontman Stuart Murdoch has delivered, once again, brilliant storytelling for the band’s ninth studio album Girls In Peacetime Want To Dance. Through the eyes of Allie, a teenage girl pondering about life and current events, Murdoch sings tales of illness, literature, and even politics. With a strong confidence in their electronic beats the band unleashed the single The Party Line, a sensual full-on disco track that may take old fans by surprise, but that will undoubtedly attract new ones. For those not comfortable with their dance skills, the album still brings mellow melodies in The Cat with the Cream to accompany a ceiling-staring session from bed. The first track, Nobody’s Empire, compromises their known folk style with their search for new sounds in a compelling, intimate story about Murdoch’s battle with Chronic Fatigue Illness and his love for music. 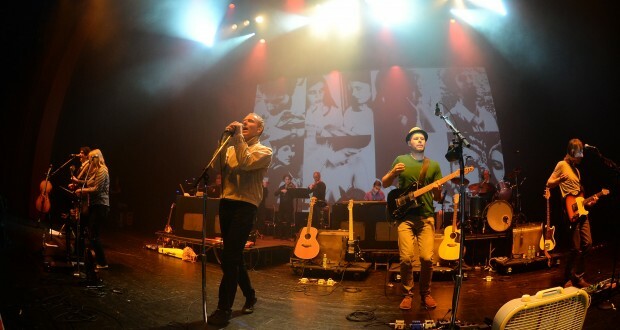 Although the lyrics throughout remain one of Belle & Sebastian’s greatest attributes and are unscathed; the use of synths and electronic basses makes Girls In Peacetime Want To Dance the gateway to a new adventure in the band’s trajectory. In the hands of Animal Collective’s producer, Ben Allen, Belle & Sebastian wave farewell to their twee habits while doing the hustle. An album inspired by Eurovision’s ABBA, Girls in Peacetime Want To Dance will definitely attract a new following but may risk leaving some old fans behind. Sweet! Will check them out!